Once a month I host a Saturday Shopping Spree ending in a meal we cook together and enjoy. April 6 was our first Shopping Spree Saturday of the season. 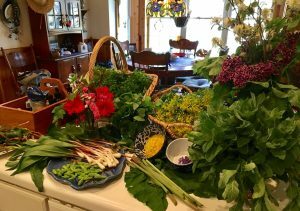 We shopped for Garlic Mustard, Stinging Nettle, Chickweed, Violets, Burdock root, wild Onion, Forsythia, Dandelion, and whatever other amazing freebies we discovered freshly stocked in God’s grocery stores. Our menu was an Asian flare. 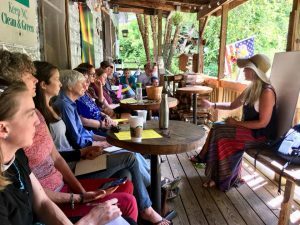 …we meet on the porch of the cozy Todd Mercantile to befriend one another, to befriend the plants and compose plant poems to share. The things we have learned about each other have been inspiring and sometimes surprising. With that same questioning twist I introduce each featured plant. My teaching rhythm begins with the question of the day, a related quote or Scripture, preceding an introduction to a new green friend to appreciate….exploring it’s nicknames, lore & history, observing it’s characteristics using all of the senses, and expounding on it’s many gifts: Edible, Medicinal, Useful, Beautiful and Spiritual and even Questionable  This class is free but donations are appreciated. “receive what you need, give what you can” (Frank Cook) Often I bring a tea of the plant we are befriending and a snack to share. Teaching Tuesday’s Befriending Plants begins May 7th, 2019. 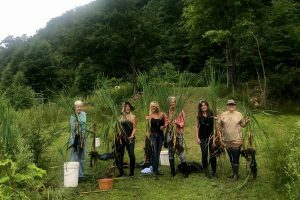 …we follow the energy from roots to fruits: learning together, shopping in a variety of wild grocery stores, sitting still and quiet in various settings just to listen to nature’s hum, garbling our catch, making a glorious mess as we cook wild recipes in my kitchen, crafting with nature’s scraps, and sharing our wild repass around the table together. Relationships with the plants are deepened and relationships with one another are forged. Bring a wild or not so wild food dish to share so we have plenty of food for lunch. 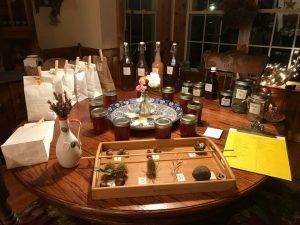 We will prepare only a few wild edible dishes together on Foraging Fridays. This class used to be weekly and now it will be bimonthly, the second and fourth Friday of each month. Check here for exceptions*. April 27 Boone in Blossom festival I will be giving a workshop similar to Teaching Tuesday Befriending Plants. July 31 Marc Williams annual Plant Walk and Fabulous Wild Food Feast This is NOT to be missed! If you wish to book a Wild Blessings experience, from a plant walk or talk to a Forage to Feast contact me to set something up. Prices vary. November 5 11-2pm at Holly’s House Bring a wild food dish to share for our potluck, a plant offering from your heart, and bone up for our final exam. Prizes for winners. This is an event only for regular Wild Blessing students. Cost is $10 per person. Here is a description of last year’s Final Fling, you can read about the whole event here. “Everything culminates at the Final Fling held early in November. 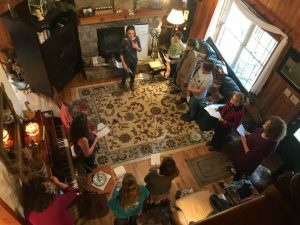 Our big event begins with an Organoleptic exam (sight, touch, smell, taste, hear), a wild potluck, and then a time of sharing green offerings from the heart. The gifts from the heart included dance, theatrics, songs, crafts, prayers, poems, prose, preaching and pictures of our year together. I was and still am in awe….remarkable talent and such passion in every single offering. I am humbled for the privilege of leading such a diverse and passionate group of nature lovers in the appreciation of Wild Blessings. 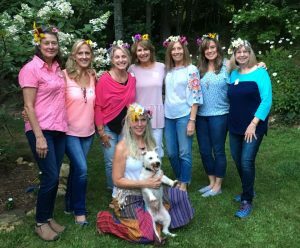 You can read about and enjoy pictures of our Wild Blessings 2018 Final Fling on my blog. Our Organoleptics test was wildly crazy! Laura Weant’s plant offering was in song. I really look forward to this season! all around and and you can reclaim your wild heritage for you and your family. Join me!